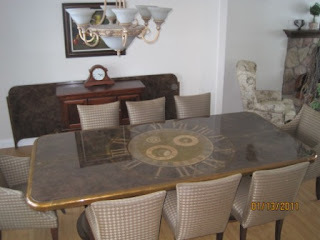 A woman in Calgary emailed me recently asking for an appraisal and some background information on a custom dining table we made over 16 years ago. I recognized the table immediately from some photos she sent along. Thankfully we have invested a good deal of time and effort over the years to create an extensive database of our many custom furniture projects, so it was not difficult to find the original job card, specifications and drawings for this table. This particular design was a customized version of our "Clock Table". It was ordered on September 26, 1994 and shipped in February 1995. This project was assigned W.O. #0142, which means that it was created shortly after our changeover from an older, less efficient job tracking system that was in place since the company's beginnings in 1967. This dining table measures 96" long x 48" wide x 29" high, and has extending ends that can receive 2 massive 30" leaves. The top was finished in a combination of gold and silver leaf which was variously oxidized, washed and glazed to create a faux finish effect of an antique clock face. The table was then coated in a protective high gloss automotive polyurethane. The top is supported by dual pedestal bases with plinths finished in matching gold and silver leaf treatments. 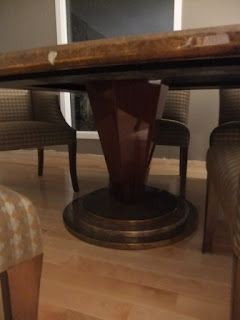 The tapered column pedestals are high gloss stained mahogany. This table was ordered through a gallery in Miami called Carriage House, and shipped to a nearby warehouse. That was as much as I knew about the table. 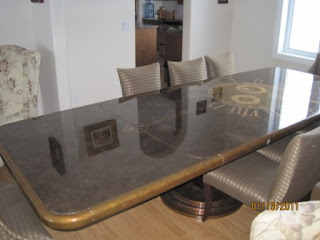 From the current owner I learned that the table stayed in Miami area for a few years before being moved to a new home in Vancouver. Four years ago that table was moved yet again, this time from Vancouver to Calgary. Considering that this table is over 16 years old and has experienced at least two major moves, I am amazed that it looks as good as it does. Assuming that it is still in near mint condition I am certain that this table has at least held its value over the years. The dining chairs were made separately by Donghia, and upholstered to complement the table. Labels: Carriage House, Clock Table, custom dining table, custom made furniture, Donghia, gold leaf, silver leaf, W.O. 0142, Wiggers Custom Furniture Ltd.
Hello! I have just purchased this table from the lady in Calgary, I live in Calgary as well and it will be moving into our first home. I was directed to your store site and blog to read about it and your work. I am so delighted to have found this piece, it is outstanding beyond what I could have imaged. I have so enjoyed reading about the Wiggers' history and viewing the other custom items that are created. If there is anything else you can tell me about this magnificent table I'd so love to hear about it, such as the woods and what is in the construction of the tabletop.